Artison Backpack: the world’s slimmest 5.1 AV amplifier? | What Hi-Fi? Artison Backpack: the world’s slimmest 5.1 AV amplifier? 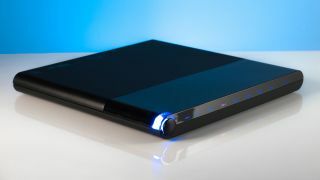 If you believe your AV kit should, unlike Victorian children, be heard but not seen – or perhaps you’re just very short on shelf space – a home cinema amplifier with the diminutive dimensions of a laptop may well be for you. The Artison Backpack is an ultra-slim 5.1 amplifier that’s just over an inch tall and measures less than 12in wide and deep, its anodised aluminium chassis capable of being attached to the back of a flat-panel display, or mounted both on and in-wall. Despite its humble build, it promises to pack a punch with five Class D amplifiers, three of which offer 75 watts per channel to the right, left and centre speakers, with the last two each delivering 30 watts to the rear surround channels. While not geared up to deliver Dolby Atmos or DTS:X, the Backpack can decode Dolby Digital, DTS, and Dolby ProLogic II/IIx soundtracks, and features 2.4/5.8 GHz antennas for wi-fi and Bluetooth 4.0 connections. Physical connectivity includes three HDMI and single optical and 3.5mm stereo inputs, while the HDMI output allows for 4K, ARC and 3D passthrough. There are also LFE and RCA outputs. The Artison Backpack is available from this week, priced £1195.